I don't know if it's just because I live in Pittsburgh instead of New York now, but gel nails are EVERYWHERE. It seems that people just can't get enough of manicures that last, and last, and last, and ... well, you get the picture. For someone like me, who likes changing her nails at least three times a week, gel nails are just NOT the way to go (plus I think it's really bad for your nails, but that's a whole other story). But I'm at least hopping on the look and feel bandwagon with the Deborah Lippmann Gel Lab Base and Top Coat Set. I admit I had been curious about this set for quite some time. I kept looking at it in Sephora, but I just couldn't bring myself to actually purchase it. What if I couldn't get my nail polish off? What if the base coat didn't work well and polish stained my nails? What if my manicures didn't last at least as long as they do with CND Stickey and Seche Vite? Well, every one of my fears and worries turned out to be completely unfounded. This base coat and top coat not only protect my nails and create a gorgeously glossy finish, but chipping is minimal to nonexistent for at least a week! Plus, removal is almost laughably simple. I've actually found myself using less nail polish remover and fewer cotton balls than with my regular base and top coat choices (sorry, CND and Seche). 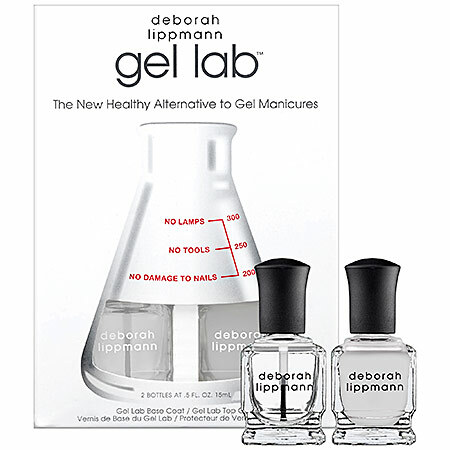 The Deborah Lippmann Gel Lab Base and Top Coat Set retails for $45 at sephora.com.